I will be running through the process of creating a vision board. Not “THE” process – a process. 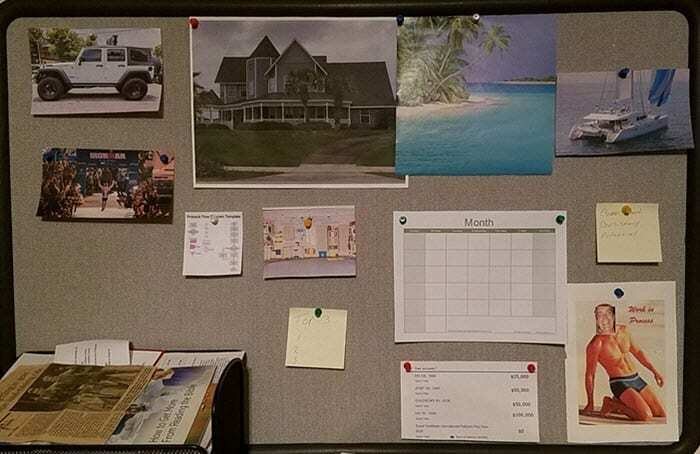 Want to assemble a vision board? If you would like to create a vision board to capture the dreams, wishes, and goals for your future here is a plan. Step 1 – make a list. Write 10 – 12 dreams you have in life. New car, new house, zero debt, large bank account – whatever it is put it on your list. Nothing is off limits – the bigger the better!! Step 2 – Take another piece of paper, one for each item from step one. Write down what it will feel like to obtain that dream / vision. Write down inspirational quotes and key sayings. – I use a few post it notes on my board. Step 4 – If you cannot find specific pictures you need – use the internet and find them. Print them off. If using a picture of a “healthy you” crop your face onto the perfect body you desire. I used one that a friend had made for a birthday card – worked perfectly. Step 5 – Put your pictures on the board – make it fun. Make it special. Model the pictures to how you felt in step 2. There is no right or wrong – this is your board! Scatter in a few quotes and inspirational messages. Step 6 – Place in a convenient location where you will see it daily – preferably multiple times a day. I have mine setup right next to my desk. Look at it and remember the feelings of accomplishment. For mine – I originally used a magnetic white board. I have since moved it to a bulletin board using pins. Whatever you choose – just do it! P.S.S. You can also take a picture with your cell phone and review periodically when you are away / traveling.